On those days when Grumpy Bear shows up, you need a good book to get you through. That book for me in the last few days was What Alice Forgot. It’s a great winter read. I suspect it could also be an awesome beach read as well, judging by the fact that the library copy I had was all gritty and there was a Damaged Noted sticker on the inside of the book that read “Type of damage: sand in cover.” It was strangely comforting to think I was holding a piece of someone else’s warm, sandy, summer vacation while I was wrapped up in warm pajamas, a bathrobe, two blankets. That plot line may not sound like anything special, it’s been done before, but it’s handled really well by Liane Moriarty in this novel. I’m still thinking about it a week later. Maybe because I could relate so much to Alice. I’m 30, I’ve been married for nearly ten years, I’ve had three kids in the last six years, I keep thinking what would my 20-year-old self think if she woke up in my life? The character development is great, and the novel manages to deal with some pretty hard stuff like marriage problems and infertility while maintaining a joyful undertone all throughout. I found Moriarty’s writing style to be insightful, humorous, and easy to like. What books have been getting you through the cabin fever? I LOVED LOVED LOVED What Alice Forgot!! I had trouble picking up a new book after I read it because it was so good and I didn’t want to be disappointed. I also just read Bread and Wine and LOVED that as well!! Did you read any of Moriarty’s other books, Erica? 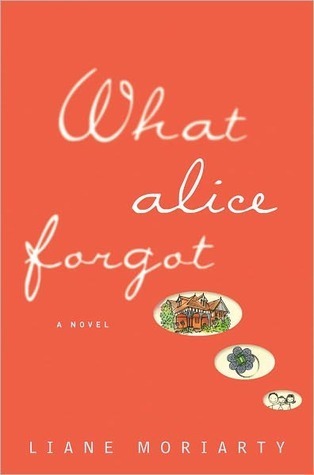 I read The Husband’s Secret and Big Little Lies but I didn’t think they came anywhere close to how good What Alice Forgot was.